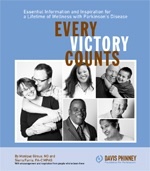 Sargent College is supporting the Davis Phinney Foundation in its launch of Every Victory Counts, a new program for living well with Parkinson’s. The cornerstone of this program is a progressive, interactive manual designed to inform and inspire people to live well with Parkinson’s and take a more active role in managing the disease. Boston University is among leading Parkinson’s research centers with contributors to the manual’s content.